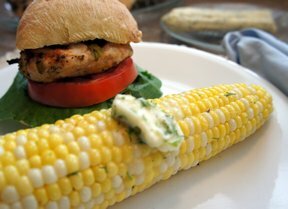 Fresh sweet corn in season is the perfect side to any summer meal. Create this butter ahead of time to make this farm fresh vegetable even better. Serve it beside those grilled burgers to complete your meal. In a small bowl combine softened butter, cilantro and seasonings. Stir until combined. Place into a small zipper bag and push to bottom of bag. Roll to form a log. Place in refrigerator until firm. Bring water to a boil on stovetop, season with sugar and salt if desired. 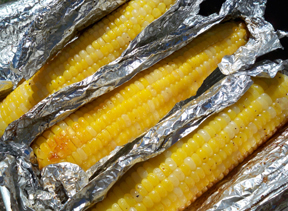 Place corn in boiling water and boil for 8-10 minutes. 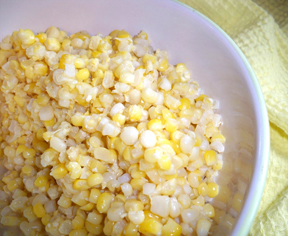 Serve boiled corn with prepared butter. 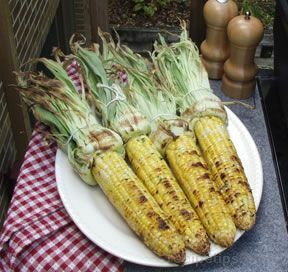 "Great way to create a new flavor for sweet corn that we seem to have so often when it is in season. I made this and keep it in the fridge just for sweet corn. It saves on my regular butter, too :)"